Mother and her little daughter having fun outdoors. Beautiful family-mom and her child girl hugging and kissing in park together. 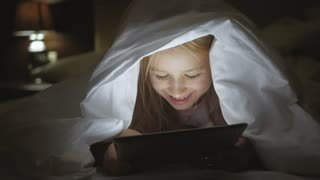 Young woman mom and her daughter watching interesting film together on tablet and laugh under the blanket. Funny mom and lovely child are having fun with tablet. Happy loving family.